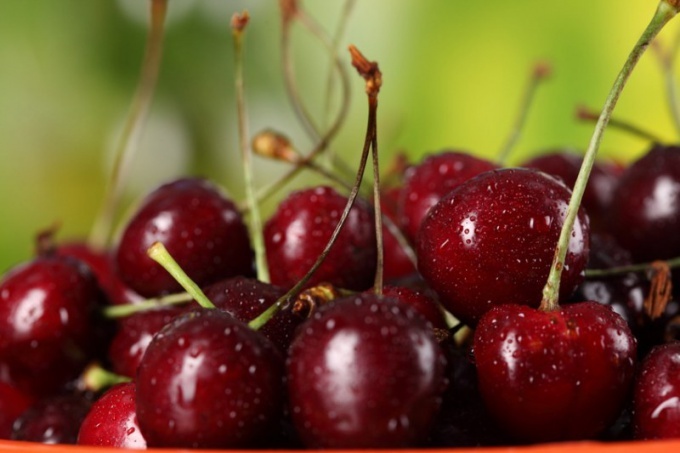 Cherry not only has pleasant taste, but also contains a large amount of useful minerals and vitamins. Due to this it is widely used in folk medicine. In cooking it is used in mousses, jellies, fruit drinks, flavored jam and marmalade, filling for pies and dumplings. Cherry is suited for the preparation of liqueurs and bitters. In the summer heat a sweet and sour compote of cherries perfectly quench your thirst. Boil the compote only from fully ripe fruit. In order to obtain the beverage with the highest amount of nutrients contained in the ripe cherries, boil it the recommended way. Sort the cherries, remove the stalk, wash. Squeeze out the juice. For this you can use a juicer, but then you have to spend a lot of time removing bones. To speed up the process, place the cherries in a saucepan and crush her usual wooden pestle. Put the resulting mass in a colander or sieve and drain the separated juice. The dishes with the juice put in the fridge. In a saucepan when cooking the compote, pour in water, bring to the boil. Stir in the sugar and add the ground cherry ground with seeds. Boil on medium heat for 5-7 minutes. Remove from heat and allow the compote to cool. Strain it through a sieve. Pour the prepared juice. You can cook the compote and frozen cherries. After you get the package with cherries from the fridge, let it completely thaw. Liberated juice pour into glass. Pour the thawed cherries with water, add the sugar and bring to a boil. When the compote has cooled, pour the juice. A peculiar taste has stewed dried cherries. First, run through it and rinse thoroughly. Soak in warm water for 30-40 minutes and then put on to cook. When the compote comes to a boil, add sugar to taste. In this compote can be put and other dried fruits, which should also be soaked. You will get a more sophisticated drink, if you add ½ a teaspoon of cinnamon into 2 liters of cherry compote. Put one cherry in each compartment forms ice and pour the finished juice or cherry juice. Such ice is good to add to smoothies. If when cooking cherry compote to add apples and plums, it will be more intense compote-assorted.